How It’s New York: Caitlin Warbelow teaches at New York’s Irish Arts Center, and this album was recorded at sessions around town. How It’s Irish: Manhattan Island Sessions, from Caitlin Warbelow & Friends, is Irish traditional music, played fresh and fierce! In the blog post we also have a Q&A with Caitlin done around St. Patrick’s Day, and a video with her playing a jig on Fox Business News! Why? Because afternoon host Gerri Willis said she would dance a jig if Bank of America dropped its plan to charge debit card uses $5 a month. The bank did just that, so Caitlin went on TV! Caitlin also appeared with some friends on The Today Show during St. Patrick’s Day week, and talks about it below. It’s one of the most exciting albums around. It’s exuberantly musical, young and energetic. There’s a session every night in Manhattan, with terrific players. 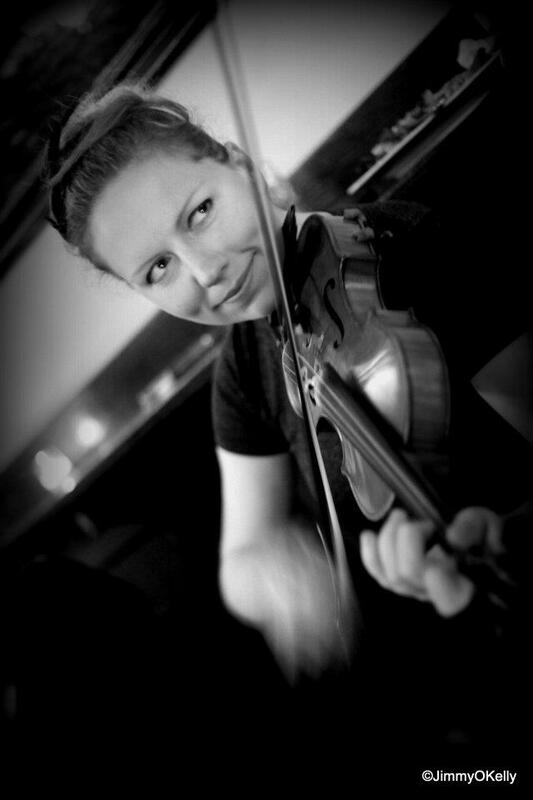 Alaska fiddler, Caitlin Warbelow’s Manhattan Island Sessions really captures this. You can hear players joking around, shouting “D” or “G”. Players are listed, but not who’s on which track. You can hear glasses being set down. You can hear the hush when Liz Hanley sings “After Aughrim’s Great Disaster.” It was recorded live at three Irish trad sessions: the Wednesday night session at Trinity Pub (299 E. 84th St), the Sunday night session at O’Neill’s Pub (729 3rd Ave.), and the Monday night session at Wilfie &Nell’s (228 W. 4th St.). Asked who is playing on which, Caitlin replies that they didn’t always know. Some purists may find this messy, but for me, that’s a charm of the album. Its rawness has an edge of danger to it–anything might happen. It’s one of the most exciting albums around. It’s exuberantly musical, young and energetic. There is virtuoso playing on many of the tracks, including Warbelow (who also teaches fiddle at the Irish Arts Center, and plays with Michael Londra and others), flute from Dan Lowery and Isaac Alderson, Sean Farrell and Tom Dunne on box, Kyle Sanna, Johnny Cuomo, Alan Murray and Ryan McGiver on guitar. Vocalists include Hanley, Cuomo, Allison Barber, Tom Bailey (who also plays mandolin). Marta Cook plays harp, Anna Colliton, bodhrán. But it’s the instrumentals that are really outstanding. “Willie’s Shaskeen Reels” is a toe–tapper, and just try sitting still during “My Mind Will Never Be Easy/The Dusty Miller.” The final set begins with a tune from Brendan McGlinchey called “Splendid Isolation,” and that has got to be Caitlin playing it. But the “whoo” whistles, the energy of the guitar strums and the flute ornaments feel anything but isolated. You’d be buying another round. And playing the CD again. NYIA: What do you love about St. Patrick’s Day? Caitlin: My favorite thing about St. Patrick’s Day is that myself and all of my musician friends are over-employed for the months of February, March, and oftentimes April as well. Strange as it is to me that there exists a “St. Patrick’s Day Season” in America, it is always exciting to hear which musicians are touring with which other musicians, to get random calls to play on TV and radio shows, and to have gigs in fancy venues that you wouldn’t usually have the rest of the year. St. Patrick’s Day is like the Irish musician’s version of Christmas bonuses. Caitlin: To be perfectly honest, even though I benefit from all of the hubbub surrounding St. Patrick’s Day, I don’t really like the over-commercialization of the holiday and I don’t like that it is so associated with drinking to excess. Another problem, from a musician’s standpoint, is that often what people want to hear on St. Patrick’s Day is not what you would ideally like to play – i.e., the general public wants to hear pub songs, “Danny Boy,” and maybe “Mason’s Apron” if you’re lucky. I think that stems from the commercialization problem, and it is a vicious circle! Shows like Michael Londra’s “Beyond Celtic” and others in that genre try to blend elements from a number of different sects of Irish culture – true trad songs, tunes, and dances mixed in with a popular or pub song here and there, and a few obligatory references to shamrocks and Guinness. I think shows like this provide a good middle-ground for both connoisseurs of Irish music/culture and those who just want to have an excuse to have a good time on St. Patrick’s Day. NYIA: How did the appearance on The Today show come about? Caitlin: My friend Sebastian MacLochlainn, a banjo player (and also a great artist, incidentally!) NYIA note: and blogger for us!) contacted me regarding the Today Show appearance – except, as usual with these things, none of us really knew what show it was for or what exactly was going on until right before we filmed. (A similar thing happened to me earlier this year when I was asked to play a jig on the set of a financial show on the Fox Business Network – I was contacted about 1.5 hours before taping and had no idea why I was being asked to play until the producers told me the host of the show had said she would “do a jig” on air if Bank of America dropped their debit card fees, which they did that day!) As it turned out, the Today show spot featured a reporter learning to do various “Irish” things, like pouring a perfect pint of Guinness and learning to make a shepherd’s pie. The last thing she “learned” to do was to “play” the uileann pipes…which was quite an experience for all of us! I have a new-found respect for beginning pipers after hearing the sounds she made with those pipes!! NYIA: Now to the album! How did it come about? Caitlin: The album was recorded over a two-month period from February to April of 2011, at four sessions in Manhattan (two at O’Neill’s, one at Trinity, and one at Wilfie and Nell’s). After the recording was finished, it was my job to sort through the 13+ hours of raw material and select tracks that could be workable for a CD release. Unfortunately, we ran into some difficulties with such things as incredibly loud bar patrons, the foot-tapping of musicians (you don’t notice how loud it is until you record! ), various musicians being on tour, people being a little hesitant about playing around a big mic set-up on the table in front of them, etc. etc. One whole night of recording at O’Neill’s was ruined because of a birthday party that came in, exceptionally drunk already when they walked through the door, with no desire whatsoever to quiet down for the music. Eh, I guess that’s live recording! The mastering, mixing, and production for the CD took place in May and June of 2011, and the official release happened in Alaska at a festival at which I am the artistic coordinator for the Celtic program in July 2011. NYIA: What’s unique about it? Caitlin: The album is about as truly live as you can get. We recorded with three mics set on a table around which the musicians sat. Our recording engineer, the great Michal Olownia, sat a few feet away with a laptop and headphones. We did not do any second takes of anything – the goal was to capture the essence of an NYC session in its entirety. I encouraged everyone to ignore the microphones and play as they usually would, in an effort to catch that amazing vibe that you’ll find in O’Neill’s when all of the musicians are in their own words but totally locked in with each other, playing the melodies but also weaving little “extras” into the tunes and spontaneously and immediately reacting to little conversational moves made by the other musicians. It truly is an amazing thing to be a part of, and to watch and listen to. For people who haven’t played in or been to a session, I equate it to being able to talk to a group of people using a language that doesn’t have any words and doesn’t come from your mouth. You’ll see little musical battles, courtships, Q&A sessions, proverbial sword-fights, and all sorts of other human interactions playing out in the microcosm of an Irish session, and that is what I wanted to put down on the recording. I think those microphones on the table did subconsciously change the way people played just slightly – knowing that what you’re playing is being recorded changes the way you play to some extent. But I am happy with the moment we captured. We may not have had a large budget (eh, we didn’t really have any budget to speak of! ), which meant we didn’t have the ability to keep on recording until everything was exceptionally perfect, but then again I don’t think we would have fulfilled the goal to capture the spontaneity of the sessions if we had done that. If a listener is looking for the clean, studio-based sound we are increasingly used to with CD releases these days, this is not the album to get. If you want to hear what a real NYC session sounds like, from the clinking glasses to the foot tapping to the moments of pure sublime musical conversation between friends, this album might just pique your interest. NYIA: What is your favorite track on the CD? Caitlin: Oh man, I don’t think I can pick a favorite track! I chose to put the first track, “Goodbye to Ireland”, on the CD because, besides the lovely playing, we had a slight miscommunication at the end of the tune – Dan thought I was going into another tune, and I thought Dan was going into another tune, but instead we just ended unexpectedly after the one reel and you can hear Alan saying in the background “awww, we were just getting started!” I love that. It was the first things we recorded in the entire project, and it turned out to be the first track on the CD. I also love all of the songs on the CD – there are five, and they range from old traditional songs to Kate Rusby to Gillian Welch to Bob Dylan. The O’Neill’s session is a bit unique in that Johnny Cuomo, the leader of the session, encourages the singing of both traditional Irish songs and songs from the American folk repertoires. To me, this is what makes the session quintessentially New York – it is a true blending of people from all over the place, playing and singing tunes from all over the place. 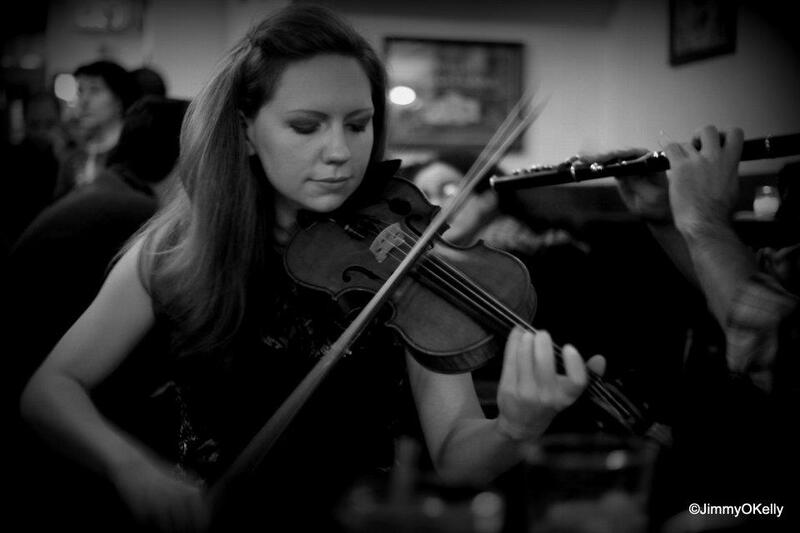 Is it the type of session you’d go to if you were looking for a staunchly traditional reels-and-jigs Irish music experience? Eh, not most of the time. But personally, as the cultural mutt that I am, being an Alaskan girl with a German last name and a musical background spanning from classical to Irish to American trad to whatever strikes my fancy, I love this sort of musical blending. It’s not for everyone, though. In terms of the tune tracks, I have to say that the final track, which starts with one of my favorite tunes, “Splendid Isolation”, is probably my favorite. It is also the most “out of control” of the tracks, with Dan and I swirling furiously around the melody of the tunes. Most of the time, we land on our feet, but a couple of times we nearly crash headlong into each other’s notes! That’s exactly what I wanted to capture on the recording, and this was one of the only tracks were we did manage to get that sort of interaction on tape. NYIA: Would you do it again? Caitlin: I‘d love to do a couple sequels showcasing other sessions around NYC. Whether we get to do that will depend on the success of this CD, and whether I can scrounge up funding for sequel(s)! I’m hoping it can be done!